Duggar Family Blog: Duggar Updates | Duggar Pictures | Jim Bob and Michelle | Counting On | 19 Kids: Josie Duggar's 2nd Birthday! Happy 2nd Birthday, Josie Brooklyn! Happy birthday to Josie the little darling! We just celebrated the 8th birthday of our micropreemie, who is an incredible testimony of God's mercy & grace. She is strong and healthy. We were looking at our daughter's newborn pictures and are amazed all over again at the miracle of her! I know you feel the same about sweet little Josie. What a sweet little girl...she is so blessed to have such a wonderful family! This world would be a wonderful place if it were full of parents and families like the Duggars. Happy Birthday little Josie! Happy birthday Josie! Cuddle with your momma today! Josie is a beautiful miracle from God and I pray that her birthday will help to ease the pain of this weeks loss. God's ways are not our ways and He will strengthen them at this time. I know that Michelle will be thanking God for her precious miracle girl in spite of her sadness at losing her baby.This family are such an example of being thankful and choosing to praise God even in difficult times and I pray for His blessing upon them today. Happy Birthday Josie!!! How lovely to see her so big and smiley on these pictures, I've just seen the series of when she was born and WOW what a difference!!! iam going to wish josie a happy birthday that this is not the real duggars running it so happy 2nd birthday josie. AWW HAPPY BIRTHDAY JOSIE, After having a preemie myself I know all of the life struggles you have to over come. But looks like your doing great I only hope and pray you continue to Grow happy and healthy. Have a great birthday Sweet Baby Girl!!!!! May God Bless you on your glorious day! Happy Birthday, Josie! I have enjoyed watching her grow- she is a blessing and a miracle from God! She has given us hope and inspiration as we struggled with our own baby, Harper Grace, who was born on April 24 at 24 weeks and weighing 1 lb 6 oz, just like Josie! She is home now and weighs a whopping 10 lbs! I'm also sorry for your recent loss, which I, too, have experienced and each one is devestating- no matter how many children you have. A baby is always a blessing from God and one does not replace the other, ever. My prayers are with you and your sweet family! Way to go Josie, I'm so proud of you! Happy Birthday Josie! God has his hand on each of the Duggars, and I know He has special plans for them all. But I suspect He has an extra special mission for you! Be happy and healthy and know how very blessed you are to be part of such a wonderful family! From Psalm 118: "This is the day the Lord hath made let us rejoice & be glad!" You are truly an unrepeatable gift of God. Happy 2nd Birthday Josie! I hope the family's sorrow will be lightened a little today in the joy of celebrating Josie's birthday. Lily and Ellie, I like your photo montage of Josie! Nice job! The layout, shadows and the 3-D effect of each picture is great. The choice of pictures could make even Scrooge smile, and Josie in her Christmas outfit is a perfect touch. One of my favorite Josie moments is when James got her to say "ot-oh" when they were at the Dr. in Little Rock for a check-up. 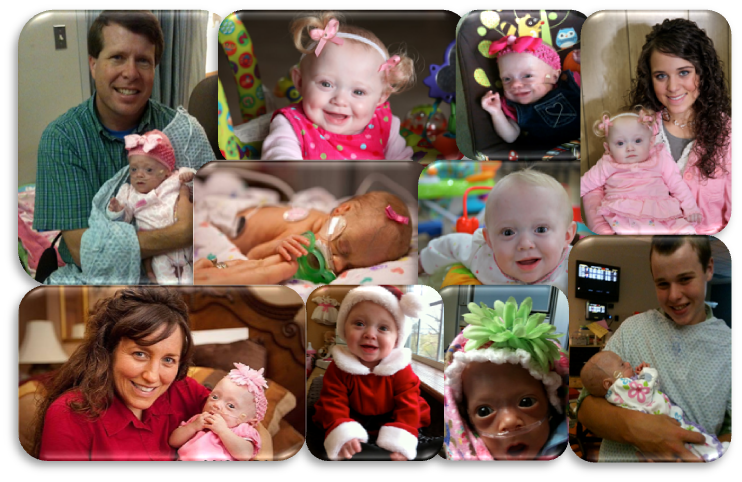 I love to see how much Josie has grown and what a miracle she is! She's amazing and teaches us to never give up. She was a fighter at a scary time in her young life and she is a fighter now at a joyous time in her life. Josie will always be a fighter! Wow!! I can't believe Josie is already 2yrs old today. Time sure goes by quickly. May God bless her in every way possible. I hope she is doing better then ever. Happy birthday sweet little Josie. I hope she has an outstanding birthday with her family/love ones. happy birthday josie.may god bless u. Yes, I agree. May Josie's birthday be full of joy. I'm sure they don't take her, or their other kids for granted. happy birthday Josie! I think God has big plans for Josie and her family even through the sadness of the loss of Josie's baby brother or sister! Josie is getting so big! Happy Birthday ! Is she walking yet ? As I said before I am only 11 years old and going on to 12 pretty soon my family has never had a preemie, but I know how hard it is to struggle with a child who hasn't fully developed and has come out of her mothers womb. Happy B-day Josie!!! We just celebrated my sisters B-day on December the 4th. It is a blessing from G-d that he has blessed Josie with another day of life!! I wish Josie a Happy Birthday!!! As parents, we are truly sorry for your loss. It is sad you will be judged by others. They have forgotten Judge not for you will be judged. The little ones that have gone Home to be with Our Father are Angels who are with you always. You and your family,are in our prayers and know that our Lord is eith you always. I wish that there were more people like you in this world. Happy 2nd Birthday,Miricale Josie! You have grown so much in the past two years and have reminded so many people how precois life truley is and even if you are small,you can do so many things.Every year is a blessing for a micropreemie and her/his family. Happy Birthday Josie......you should come to NY and I will bring my granddaughter and you two can play together......Hope you had a wonderful birthday! Happy Birthday, dear Josie! May you grow more and more in His eternal Grace! Happy Birthday Josie!!! God bless you today and always! I hope you always realize how God blessed you with such an amazing family! You are such a miracle! Hope you have a good 2nd birthday!!! Happy Birthday, Josie. Such a beautiful little lady, you are. -Happy Birthday lil' Miss. Josie Brooklyn!! -And many for years to come!! Hi Love and respect your family,You hav been a blessing to me personally. Thank you for your christian witness,your love and your joy ! The first Christmas present ever was a child!